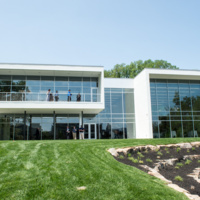 The Griffin Center is a 12,700 square-foot meeting and conference space overlooking Reflection Lake and facing east towards campus. The Center’s largest venue is the Grand Hall, with space to accommodate more than 130 guests and striking views from floor to ceiling windows. Other available venues include a private study for small committee meetings, an atrium lobby and multipurpose meeting spaces that can be configured for groups of varied sizes and needs. The building is named to honor the Robert E. Griffin family for their years of support for the University. Learned a lot! Hope to do it again next year!